I know to some of you our "move" seems unconventional to put it mildly. Even my husband commented last night that the way we've handled this renovation and the moving process "has been weird". The reno part took far longer than we had ever considered, since we ended up having to do much more work to get things ready to move in. We've been doing a little at a time. Mostly because my husband is still working at a demanding job, and then there's "me". I'm not as young, healthy, or emotionally with it as I used to be; when a move was still a big deal, but not a serious life challenge. Trying to keep my stress level manageable, we've been trying to get the new house put together to make it an easier transition. In the past I've done a move where I've had so many boxes clogging up the rooms that I couldn't even turn around. I can't handle that anymore. We're getting a lot done, it's just taking us a long while. I've wanted to get furniture placed and boxes unpacked and put away before I take on the next installment. 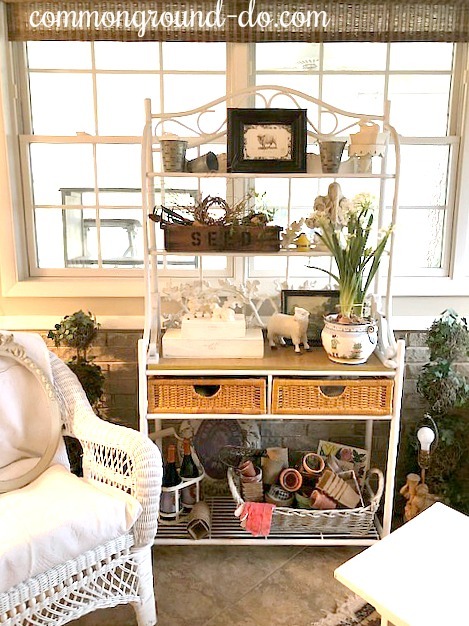 We got all the "white and chippy" pieces tucked into the Sunroom this weekend. It was so good seeing it all come together, finally having some space to use the pieces I've had in storage or unused in the corner of the basement. I'm still not sure about a few things and no doubt there will be some tweaking and musical chairs, but the bigger things are out there. These sconces have been a mystery for the last almost 6 years. At the time they were packed away two moves ago, our daughter was doing most of the packing because I wasn't able to do much. Items were shuttled to different rooms, and even though they were used in the Dining Room, they ended up in a box marked for my office. I didn't have space in this house for many "office boxes", so much of it ended up in storage. I've hunted through tons of boxes looking for them, but they never showed up. I found them yesterday and I have to say it was the closest thing to a "jump for joy" moment that I've had in recent history. 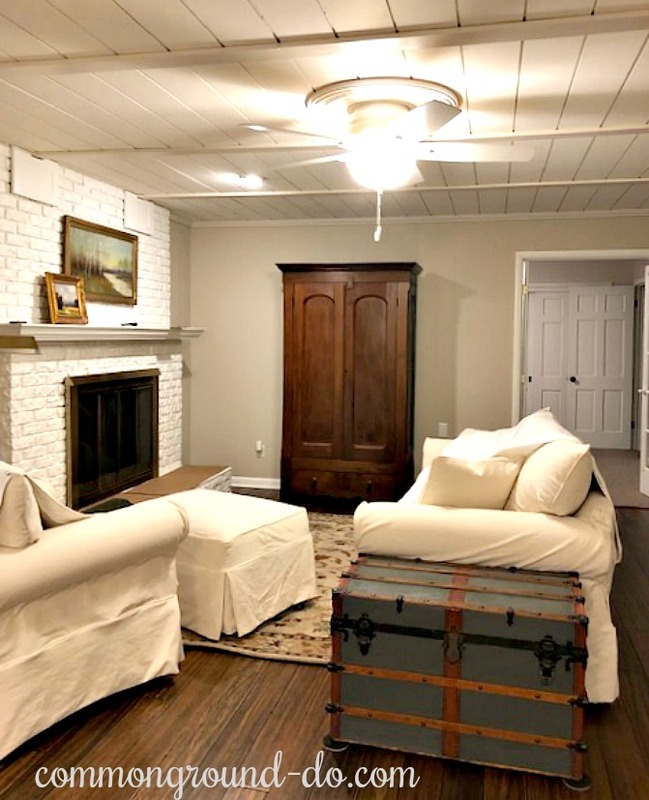 From the first time I walked into the Hearth Room at the new house, I had wanted to turn it back to it's original purpose, which is a cozy spot by the fireplace and a snuggle-y place to relax and watch a little tv. 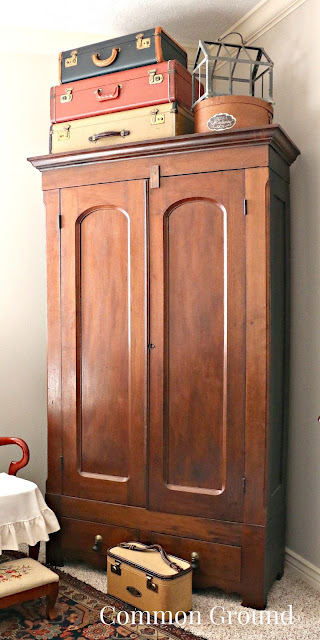 I envisioned using one of our antique armoires as a tv cabinet, but I knew it would take a little clean up on the inside. 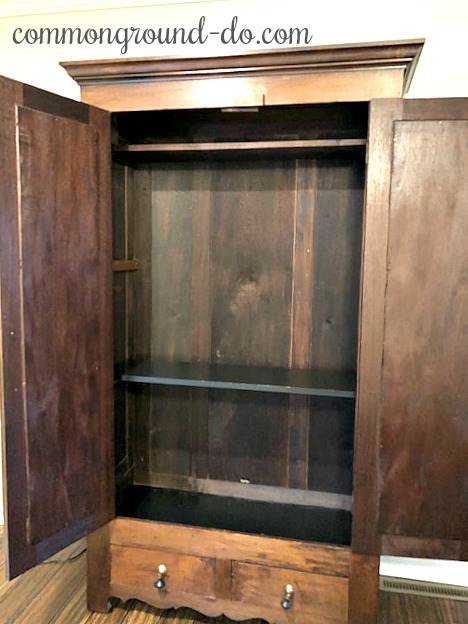 I re-stained the outside of the cabinet and painted part of the interior in black. Here's a pic from the Master Bedroom in our current place, and below that used in the rental. Even though it's big, it's pretty versatile. This pic below, was taken a few weeks ago, and we've made more progress in here. Things are looking more "homey", and last night we hung a mirror above the mantel, which makes a statement. Don't know if it will stay there because it's big, but it's on a test run. Lamps have been added, and a little bench from the kitchen sitting room for a coffee table/ottoman. As we work, we find ourselves taking a break on these comfy cushy slipcovered seating pieces. I'm sorting through boxes and boxes of previous "flea market" inventory, trying to decide it's fate. Six years ago I had to shut down my vintage business without warning because I had a blood clot in my heart. Because of my health issues, so much of it ended up in our garage. I've needed to do this for the last 6 years, so I'm finally getting the opportunity to not only declutter, but shed some baggage that I've been dragging around for way too long. Just like everything with this move it's proving to be a process, but the new place is starting to look and feel like "home". Love love love that armoire moved from your bedroom to the family room area. It really pops in the neutral space and your slipcovered furniture. Just a beautiful piece. I think that needs to come live in my house lol! Just beautiful. Things are really coming together and pretty soon you will be completely moved in and start living full time. thanks Kris, I thought about using a smaller white one that goes with my office set, but thought the dark wood might be a good contrast. I'm excited to get prints up in that little space. 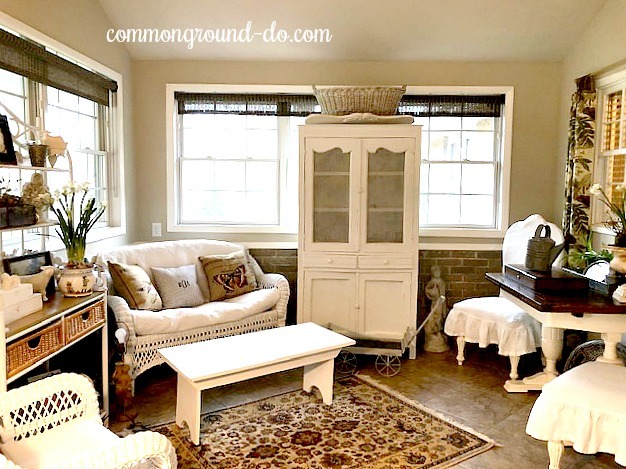 Debra the stone and all the windows in this gorgeous room are just perfect for your vintage garden style! I can't wait to see how you style it for the seasons! Hi Amber! I wish it were a little lighter and brighter in there, but someday I hope to have a paint makeover. But right now the windows bring in so much needed light to the rest of the house, that I'm really grateful for. Oh Debra, this is such a pretty room and you are making this house a total show place. thanks Marty, I'm really excited to see it all come together. It's really fun to see everything coming together for you. We're putting our home up for sale and considered renting an apartment for 6 months to be out while it is shown, but considered the cost and decided to rent a storage unit and get rid of as much as possible. Glad those lights jumped out of the box finally! My husband thinks I'm crazy to pack everything myself, but I have to know where things are packed just to avoid issues like you had. Hope things go well with your house sale. Sounds like you've chosen the easier way to go. Getting extra things out really helps to sell. We just had too much in the smallish rooms. You'll be ahead of the game when it's time to move! The sunroom is adorable but I knew it would be. 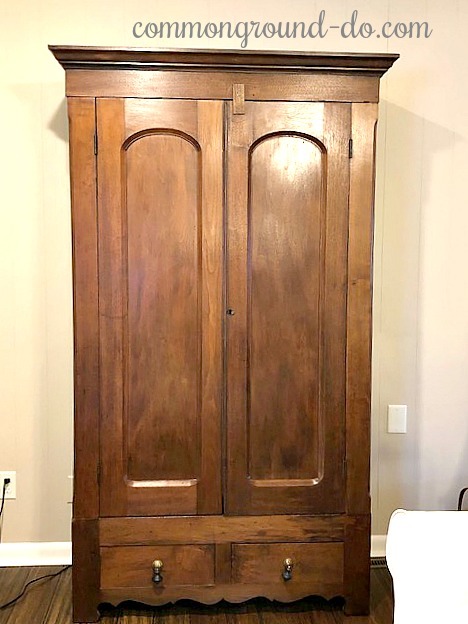 The armoire is gorgeous. We had a t.v. in ours for years. It may be time to bring that look back to our living room. I hate looking at a black t.v. I'm so glad you found the sconces. Thanks Katie, I'm with you on staring at a tv screen by itself. I'm thrilled that the armoire actually fit the spot, I was a little worried! I so look forward to your posts to see what you've done next!! Love what you have done! Thanks Mary, so glad you came by! Debra, it is looking so wonderful! Your move doesn't seem weird to me at all, because we are doing our move even slower. We sure feel our age a lot more now, and just don't want the stress and pressure of doing it quickly. So to me you are doing it fast lol! Oh YAY, Linda! I'm so glad to know I'm not alone! Anytime there's any "pressure" coming at me, I just recoil and semi shut down. My husband knew not to push me in this, because I would have run away from home. haha! Really enjoyed this post. We have my Aunt's kitchen cabinet which looks just like yours. I was undecided about painting it, but I'm going to as yours looks so good painted. It is in the same room with a civil war area corner cupboard which I would never paint. I think the cabinet painted white would brighten up the room. We were going to move 2 hours north but we just found out we are going to be great grandparents and we would be far away from that new sweet little baby so am trying to do some updates in our 1897 house. Blessings! Congrats on the new great grandbaby, glad you're going to be around to enjoy it! I had a similar cabinet years ago, that was stained wood, but I really do love the white look. Have fun painting yours! I so look forward to your posts!! And I am so glad you have a sunroom to decorate again, love your style out there!! What fun!! 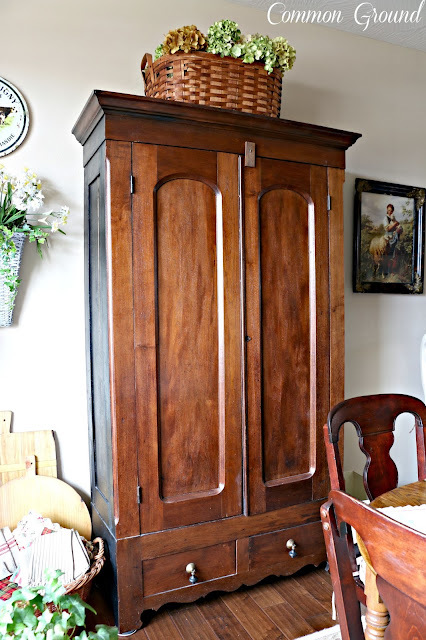 The family room looks great and cozy too, love the armoire, just perfect. thankyou so much, you're a dear. I so appreciate that you enjoy coming by to visit, and are here after all these years! Well, I certainly understand what you mean by process. Enough said. Your sunroom is going to be my favorite room, I can already see that! Here's hoping you enjoy lots things to warm you heart this week. thankyou Rita, I know that you understand. It was so good for me to see the sunroom come together. I've been planning it my head for months! Your new home is looking beautiful. I love everything that you have done and I know you will enjoy your new place. Hey Friend! thanks so much, I just ran over to your instagram page and drooled all over your pictures, especially your chairs! Oh how glorious to have a sunroom, what I wouldn't give for one!!! I'd have it stuffed full of plants, ha ha!! On I love the armoire and I also love the ceiling! Sunroom maybe in my next life! Hi Cathy, thanks so much! I really love that ceiling, it was a real draw for the house with me. I'm super excited about the sunroom since it has heating and air. thanks so much, they really need to be ironed. I bought the set thru Sam's Club, but it's another company that they just are affiliated with named Klassner. When we moved from Wisconsin to Illinois---our boys were 4 and 2...and we stashed them with my parents (the only time) while we set up house over 4 days. I can totally understand, making a home---in a house. And, now at my age---I would want to do it your way. So, glad you are taking it easy during the process! And, it is looking GREAT! Your furniture pieces are gorgeous! I am thrilled for you that things are beginning to fall into place for you! 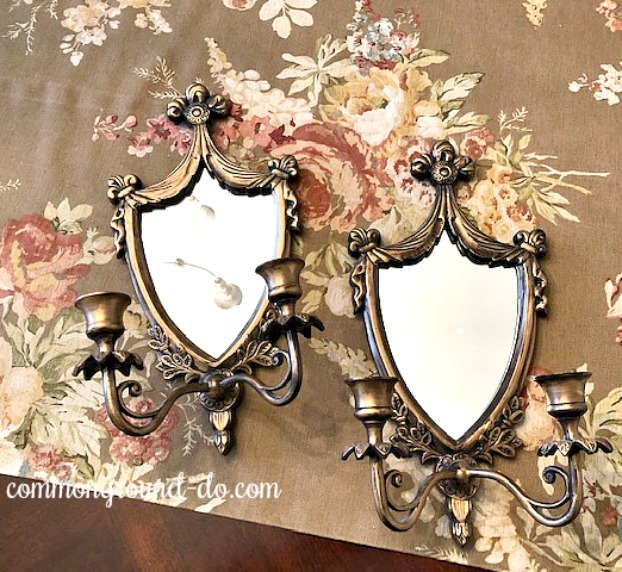 So~o~o glad you found the mirrored sconces! When we moved from our rental here 17 years ago, two pieces are still missing. After the first year, I just accepted that they were tossed out with all the packing paper. I agree, that putting things back together room~by~room is a great way to unpack. Hi, I too love the look you are creating. A final nod to every room is a plant. Their vitality adds such a warm gracious feel to a living space. I know that I couldn't do another move at my age or if I did, it would take months to get settled. I love that cabinet and it looks great in the hearth room as does that beautiful trunk. Thanks for the tour of your new home, Debra! I have enjoyed following your blog for years so it is fun to see familiar things used in different ways. You have such great style. I am getting older too. We are planning on downsizing our house but I told my husband it will take me a year to "find homes" for all the treasures that I won't have room for. Your post is my inspiration.